The All-Star Game tips off Sunday night at 8:30 p.m. EST. Zach LaVine of the Minnesota Timberwolves dunks as NBA players look on in the Verizon Slam Dunk Contest during NBA All-Star Weekend 2016 at Air Canada Centre on February 13, 2016 in Toronto, Canada. NOTE TO USER: User expressly acknowledges and agrees that, by downloading and/or using this Photograph, user is consenting to the terms and conditions of the Getty Images License Agreement. 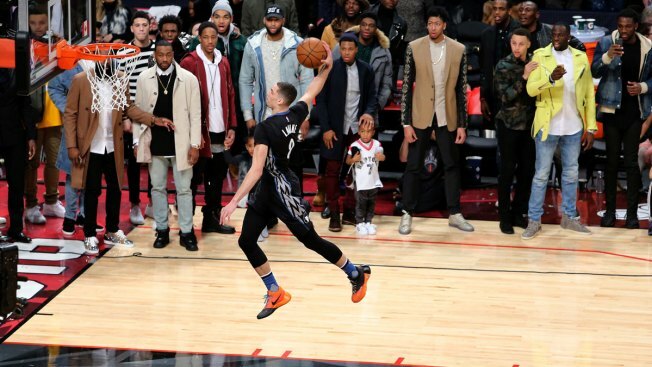 After outlasting Aaron Gordon in what many believe was the best slam dunk contest in All-Star weekend history, Minnesota Timberwolves guard Zach LaVine posted a touching tribute to the late Flip Saunders on his Instagram and Twitter accounts. Saunders, the Timberwolves president and coach, died suddenly from Hodgkins lymphoma just days before the season started. Saunders drafted LaVine 13th overall two years ago despite the young guard playing only one season as a bench player at UCLA. LaVine posted a photo of his dunk championship trophy resting on a black Timberwolves jersey. The name "FLIP" was written across the back and LaVine's No. 8 was rotated horizontally to mimic an infinity sign. "I dedicate this dunk contest and the trophy to my late coach, Flip Saunders and the Saunders family," LaVine wrote. "He's the one that always believed in me and drafted me! We all loved Flip and his memory will love on forever!" The All-Star Game tips off Sunday night at 8:30 p.m. EST. With Kobe's final All-Star chapter the main storyline, the East and West clash in the 65th edition of the showcase event.